We are bracing for yet another snow storm here in NY! A blizzard in fact! Have you seen a lot of snow in your area? I'm warming up over here with this collection from Salon Perfect though. I *almost* passed on this one but I'm so glad I didn't! The Love, Lashes and Lacquer collection includes 7 nail shades and 5 lash sets (I don't have these to show you) for Valentines inspired polish and lashes! Salon Perfect In Love I'm in love. Sorry. Had to be done. But holy cow! This pink!! This formula! GAH. This is one coat. One coat of perfection in a bottle. This is a creme with an excellent formula, goes where you want it (I did no cleanup here), covers in one coat, self leveling and high shine (no top coat here). I can't say enough good things about it. 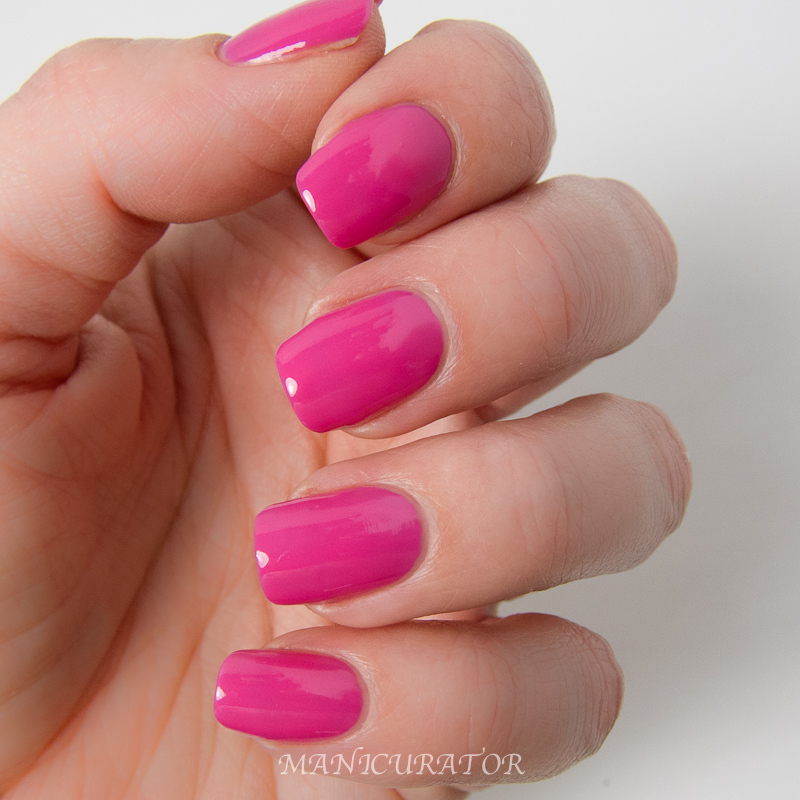 Salon Perfect Hearts-a-Flutter - one coat, on ring finger over In Love. 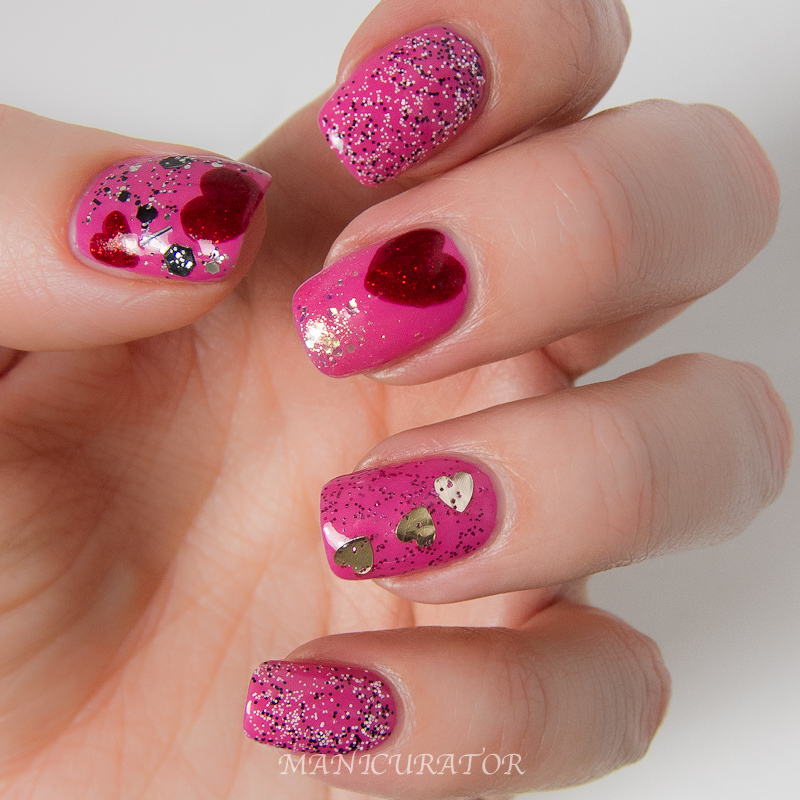 Great combination, the gold hearts (which are easy to get out on the nail, just shake, or flip the bottle upside right before you paint) and the fuchsia glitters are perfect together. No issues with formula. Salon Perfect Loves me, Loves Me Not - this one is so sweet! Pale pink matte micro glitters. YES! I did a gradient on Index and Pinky with this one on the tips and Touchy Feely towards the cuticles. You can see if you look closely that the pink matte glitters are a bit smaller than the white ones. Gonna layer this one over pure white next time I think! 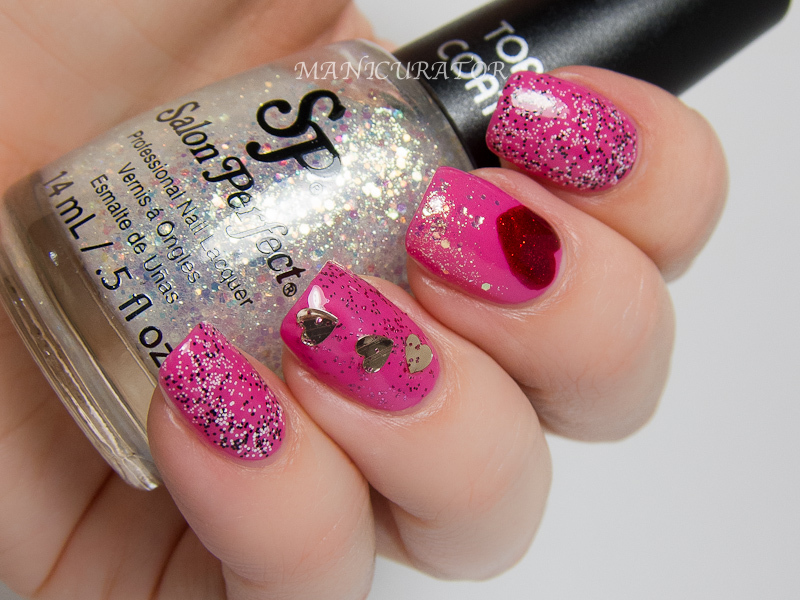 Salon Perfect In Love is so so pretty! I put this on the tip of my Middle finger under the heart. It's hard to tell in the photos just how magical and sparkly it is! 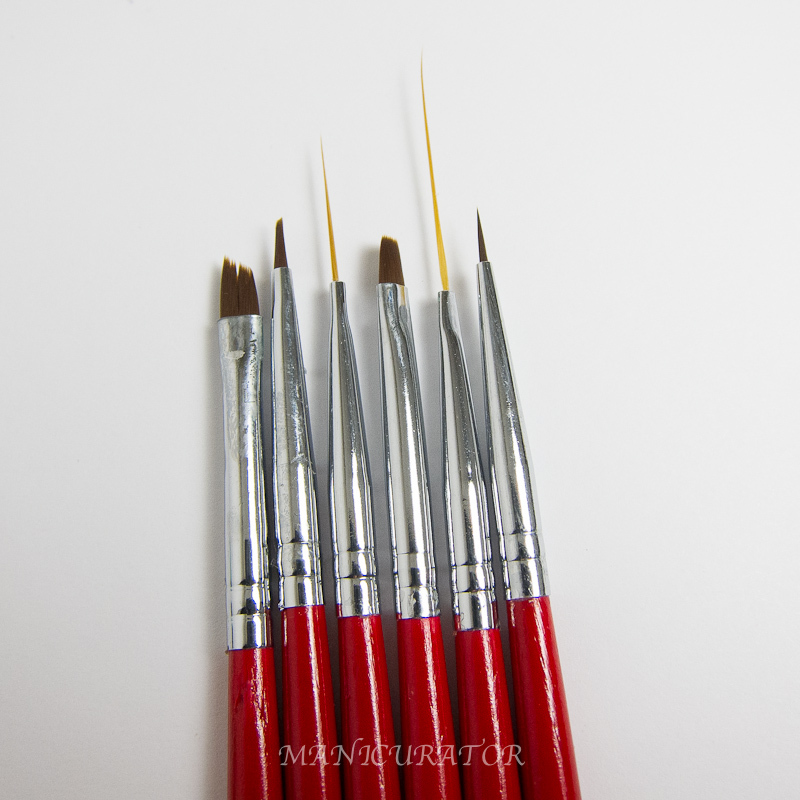 The heart is freehanded using the Winstonia brush and He's With Me! Both have a great formula, no issues at all. And lastly, on the thumb I dabbed on Cosmic Black which also had no issue in application, just have to mention that there is slight curling of the small silver glitters in my bottle. They don't stick up off the nail and it's still usable for sure. Oh and did you notice my slight change of nail shape I've got going? I had a corner crack off the other day and instead of filing down I uh, rounded instead. No, it's not a drastic change, but I'm not a fan of change and expected to dislike the new look. I did in fact dislike it the first day or so, but now? I might actually be liking it. What do you think? And which of these Salon Perfects do you want to add to your collection? Pretty collection! Love the manicure you created with it too! Loving your thumb! I may have to go grab these before my little brother's school party tomorrow! I do like your new nail shape but you have gorgeous nails so anything would probably look good! 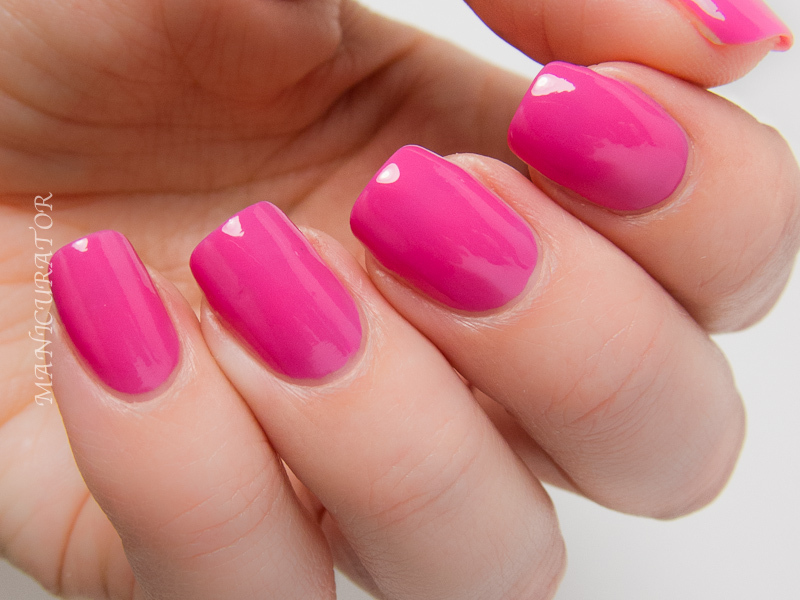 Great colors and top coats - especially love In Love - what a fabulous pink! By the way, I so enjoy your emails. Thank you. In Love is a perfect pink shade!